Last year we did a post on Athena’s mother’s house in Santa Clara Pueblo just north of Santa Fe in New Mexico. It’s almost been about a year and a half since the house was completed and it looks absolutely beautiful inside and out. Her mother, Rina, has been devoting a lot of attention to the grounds around the house, quite simply, it’s a fabulous space to be in. 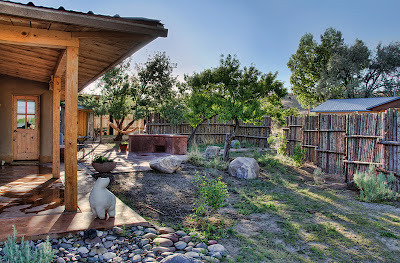 I just photographed the house for New Mexico Magazine, the images will run along with a story written by writer Charles Poling that is beautifully done. Perhaps we’ll put it on our new website that is currently in the works. So I got to thinking, many of you won’t find the magazine on the newsstands where you live, aren’t going to order it by mail and I’m pretty sure it won’t go on the magazine’s online version. Therefore I decided just to post some of the images that will be in the article. It’s the August issue and it will be out on the stands in about a week so I think that is close enough to the release date to keep everyone happy. The photo below is the exterior towards the front door. Photo taken just as we arrived, never saw another cloud for 3 days. Funny thing about this image, which will run as a two page spread is that the new editor of the magazine from New York could not believe that there were really clouds like this in the southwest. Cedar “coyote” fences on the north side of the building with native grasses and plants starting to take their places. 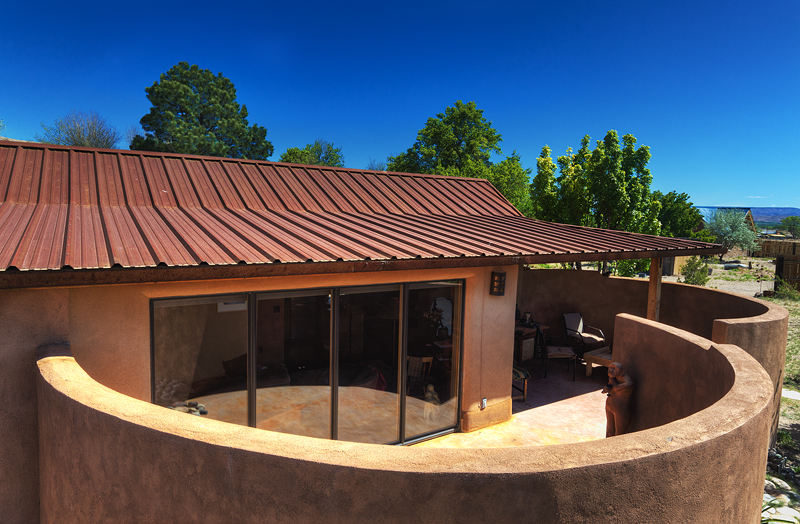 Southern exposure of the house with curved patio walls. 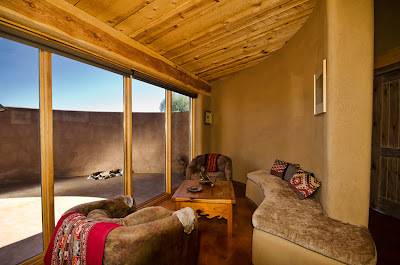 South facing windows for passive solar, the patio is basically kept empty with some of Roxanne’s sculptures. If I were to make a good guess at it, I would say that Rina loves the use of negative space in the right spaces, this would be one. Looking out from the same location through the shade cloth. 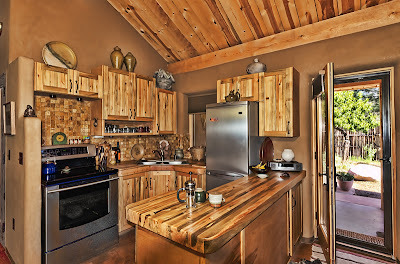 Kitchen space, cabinetry and countertop by our son Oso. Look towards the front door and built-in dining area. Athena, sister Roxanne and Rina plastering the adobe seat “banco,” although our son Benito did most of the plastering in the house. 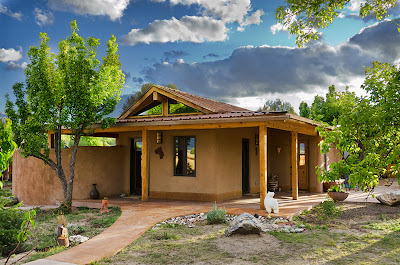 I read “house of earth and sky” in the Autumn 2006 Su Casa Magazine with interest and have poured a mud floor in a small sun-room we constructed. We brushed on boiled linseed oil. Two coats of were mixed with mineral oil, then linseed oil without any mineral oil was used for the final coat. Our floor is not as shiny as Rina’s floor in the photos, so we are wondering what kind of finished was used to make the floor shine. If floor was was used, what type was used. Your help is appreciated. Leslie, don’t know if the article implied that it was an earth floor, but it is concrete and that’s why the look. The article does “imply” the floors are mud. Rina that she “…convinced Ralph to allow all mud floors…” and Rina states: “I like the idea of a soft floors,” Your photograph of the floor on page 101 shows the floor is not smooth like concrete but shows “ripples” like mud would make. In any case I appreciate the article and photographs. They were inspirational and we enjoy our mud-poured floor. Everyone who visits us out in the remote area of White Rock near Lake Valley are impressed. 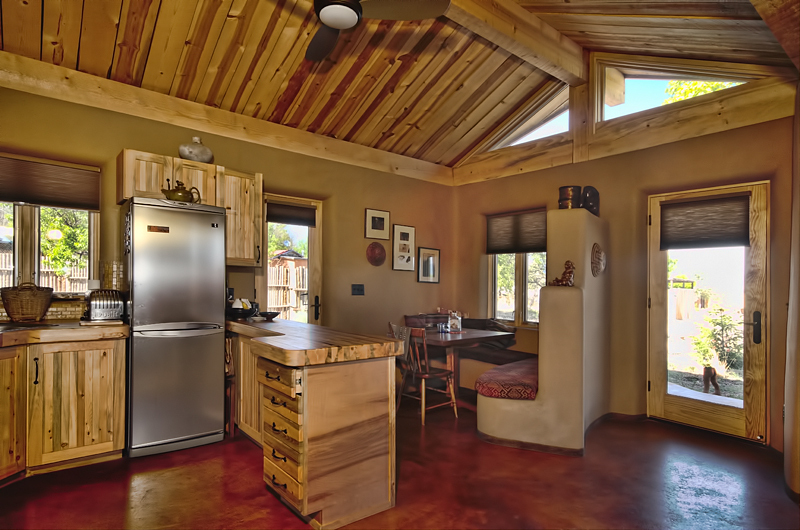 I will order the Canelo Project 2009 and the Straw Bale House with Athena’s house for resources. Thanks again. Wow, sorry about that, never caught it myself. I don’t know where it got confused, but her husband Ralph was not even alive when it was built, but that was the case when they built their first house many years ago in Santa Fe. 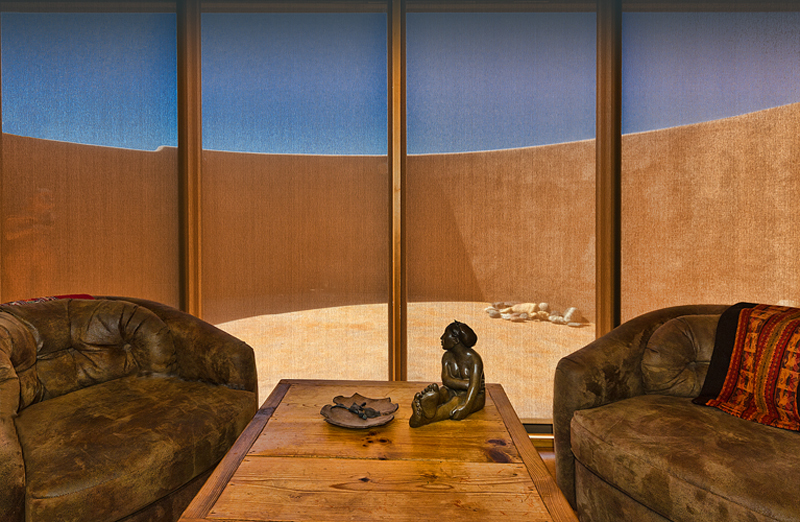 Bill: I don’t want to seem too forward, but do you think my wife and I can look at Rina’s sun-room in Santa Clara? 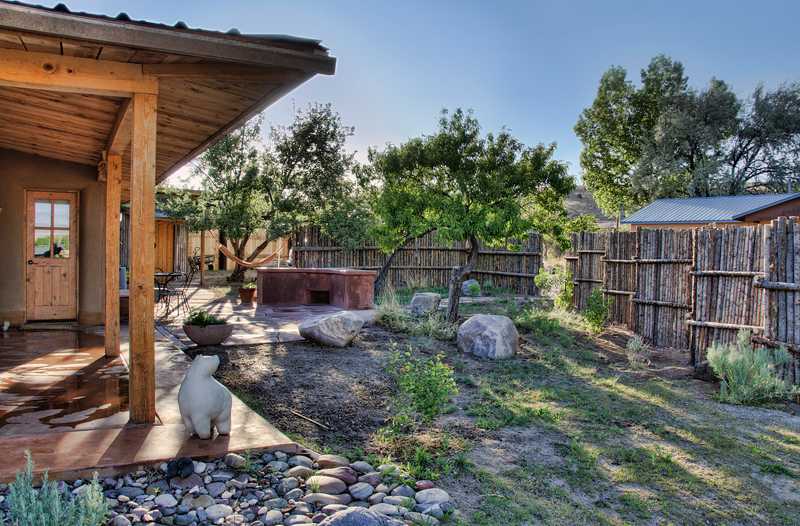 I had an uncle who was married to a lady from Santa Clara (both deceased now) and because of them living in an adobe home, we built our home in Fort Defiance out of adobe. 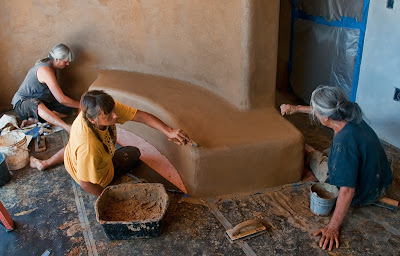 In fact, my son and I attended the Southwest Adobe school in Los Lunas several years ago before attempting to build our adobe home. Now my wife and I are attending to make our White Rock hogan-home more comfortable. In closing, I like your photographs of Rina’s project home. Here’s wishing you continued divine health and prosperity. Leslie, the best thing would be to email her directly and ask, most likely so. Linseed oil was the finish on the floor. But apparently there is something misleading in the comments in that the floor is concrete, that’s the difference. Send me a personal email and I’ll forward her email address. 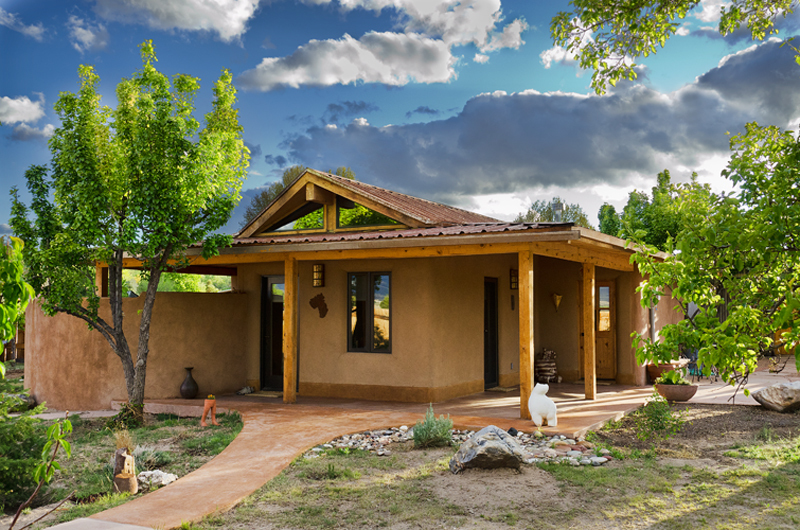 Bill, I love the simplicity of this adobe home! I live on the Navajo Nation and I am looking to build a place of my family. Is the blueprint for this home available for purchase? There isn’t a blueprint that I know of, but it could be easily recreated. My mother-in-law, Rina, is an architect, doesn’t practice, she designed it on paper. She is a resident of Santa Clara and perhaps could help. What does the bed room look like?